You’ll be blown away by the enormity of America’s first offshore wind farm. 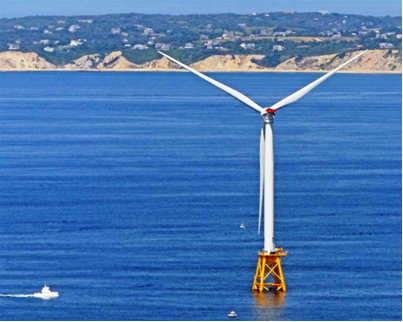 The Block Island Wind Farm was designed and built by Deepwater Wind. The charter boat SNAPPA became involved with the Deep Water Wind project in 2009. We were hired to use an ROV (Remote Operated Vehicle) to scan the ocean bottom. There were 12 predetermined sites that had to be surveyed to insure that there were very few or no rock outcroppings in the areas. A sandy bottom was required because the steel foundations would be attached to the bottom by a pile driver sending a steel cylindrical tube through a “jacket system” some 200 ft. into the seabed. After 9 years of applications, planning, surveying, permitting approvals, meeting all state, federal, US Coast Guard, environmental regulations, and construction delays, the project has finally reached completion. The first phase of construction took place in the summer of 2015. When the steel foundation’s fabrication process was completed in Louisiana, they were place aboard barges, towed to RI. The journey took three weeks. During the next five months the foundations were fitted to the ocean floor. Each was lowered and raised countless times on to barges to be transported to Davisville for refitting by RI steel workers. After each foundation was fine tuned to fit on the ocean floor, the first phase of the project was completed in November. The second phase of construction started in June of 2016. With the arrival of the power cable, towers, blades, generators, nacelles, and jack-up rigs, work began again. Needing a stable platform to work on, 3 jack-up rigs were brought in from the Gulf of Mexico and Norway. A jack-up rig is a barge or vessel that has telescopic legs that lift the hull out of the water to create a tall, stable work platform at sea. The 433 ft. vessel from Norway named the Brave Tern owned by Fred Olsen Windcarrier with a gigantic crane was specifically built for a project such as this one. The ship traveled 3600 miles to arrive in RI two weeks later. Its lifting capacity is 800 tons and can reach higher than the Statue of Liberty. The Block Island Wind Farm will have a total generating capacity of 30 megawatts, enough to power 17,000 homes. The wind farm is expected to supply more than 90% of Block Island’s annual energy needs. However, only 10% of the wind farm’s energy will be used on Block Island with the rest exported to the mainland power grid. To put the first offshore wind farm in perspective, Deepwater Wind will operate this 30 megawatt farm while the United Kingdom in Europe has already developed enough farms to produce 5000 megawatts. The turbines will start spinning and generate power at wind speeds of approximately 6.5 mph. and will continue to operate in winds up to 56 mph. Additional children under 12 add $30/person. All of our tours are available for private groups or individuals. A list of singles and couples will be blended together to form a group. Tours will began at 2pm and return at their respective time unless otherwise specified. We are flexible with the departure time to meet your need. On each wind turbine tour Captain Charlie Donilon will include commentary and a brief history of the North Lighthouse, the Southeast Lighthouse, and a drive through of Old Harbor. He will also discuss the entire wind farm project from start to finish. 3 Hours - Includes history of the North Lighthouse, Southeast Lighthouse and a drive through Old Harbor. 4 hours - Includes perimeter your of the west side of Block Island and the worlds greatest sunset at not additional charge! Private Groups can choose any date and time. If demand exceeds supply, more dates will be added to the schedule.